Artificial light and modern schedules have become the bane of a good night’s sleep. Light from your TV or a tablet near bedtime makes it harder to fall asleep, while daylight shining through the window may wake you up before you’re quite ready. That’s because the human body responds to light by producing more or less of the hormone melatonin, which induces or disrupts sleepiness. Now, regulating your melatonin levels could be as simple as switching on a light bulb. 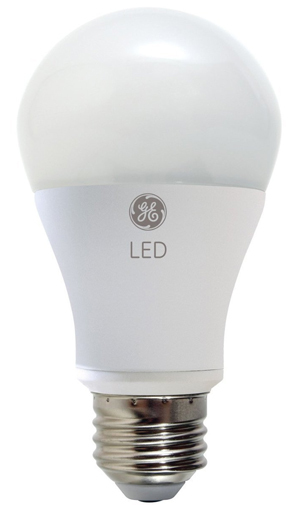 GE has introduced two new LED bulbs, Align AM to help you wake up and Align PM to help you fall asleep. Interestingly, Techlicious testing shows both work as promised. The Align system is based on the principle that changing the concentration of blue light you’re exposed to at particular times alters your melatonin production and, in turn, your circadian rhythm or natural sleep cycle, said Dr. Gary Arlen, principal engineer at GE Lighting in East Cleveland, Ohio. More blue light suppresses melatonin production; less blue has the opposite effect. TVs and tablets produce a bluish light that sleep experts say disrupts sleep cycles and should not be used at bedtime. The Align AM bulb mimics daylight by emitting a concentrated bluish-white light that suppresses melatonin production. Conversely, the PM bulb produces an amber hue like a campfire that has no impact on melatonin production, making it easier to fall asleep naturally. GE Align PM on the left and GE Align AM on the right. According to the company’s instructions, switch on the PM bulb 30 minutes before you want to fall asleep, and turn on the AM bulb for 30 minutes after you wake up. 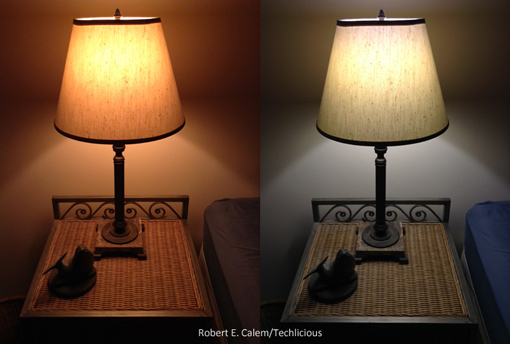 I tested this pattern on multiple days with two of each bulb, one per table lamp on either side of my bed. I indeed found them to be effective. Very soon after turning on the PM bulbs, I began to feel sleepy, although the light quality seemed unnatural to me. Similarly, after the AM bulbs were lit, I had the sense that I was waking up more quickly than usual. As someone who normally prefers GE’s Reveal or daylight bulbs anyway, I found the AM bulb’s light to be comfortable and familiar. The problem was, to test or use both types of bulb, I had to swap them in or out of the lamps. It’s impossible to go to sleep with one and wake up with the other unless you have two sets of lamps (one for morning and one for night) in your bedroom. There’s another hitch: If you fall asleep with the PM bulb on, it may still be on in the morning when your goal is to wake up more easily. To get around these issues, GE suggests using the PM bulb in the bedroom and the AM bulb in the bathroom or kitchen, where you’ll likely go right after rolling out of bed in the morning. Both the Align AM and Align PM bulbs are traditional, A-shape bulbs that fit in traditional tabletop or floor lamps. Like other LED bulbs, they are not intended to be used in fully enclosed fixtures like those found on ceilings. Both types are rated to last 22.8 years if used for three hours per day. The Align AM bulb consumes 11 watts of energy and generates 900 lumens of light. The Align PM bulb consumes 7 watts and generates 350 lumens. If you think these bulbs sound like an interesting way to regulate your sleep cycle more naturally, there’s an even better alternative on the way. Tom Boyle, chief innovation manager for consumer lighting at GE Lighting, has told Techlicious that a new, programmable LED bulb expected to be released at the end of this year will offer both the AM and PM functions in one unit. You’ll be able to select and schedule wake or sleep hues via an app. Curious why, when I wake up in the middle of the night and turn on the TV I fall back to sleep almost immediately….and when I don’t I lay there and toss and turn? PM bulb being on in the morning isn’t a problem as long as the AM is too. It’s just a lack of blue light. It doesn’t make your body make the melatonin, just avoids the kind of light that suppresses it. So both together still = suppressing it. For the TV helping my guess is habit. Like once you’re used to white noise you start needing it. Routines are super powerful for sleep; ask anyone sleep training small children. Being that over a year has passed, has this new product been released? Yes. You can buy the GE C-Sleep bulbs for $49 on Amazon. The C-Sleep bulbs transition from “PM” for warm light in the evening to “AM” for crisp light to wake you up to “Day” for regular light. The changes are programmable in the GE app.